Roscommon Abbey was a Dominican priory founded in 1253 by Felim O’Conor, king of Connacht. It was one of the most important Dominican houses in medieval Ireland and was the first priory of this order to have been founded in a Gaelic context. It continued in use down to the second half of the sixteenth century when it was taken into the hands of the Crown as part of the whole Reformation process. The original priory church at Roscommon, which is still largely standing, must have been one of the finest mendicant churches ever built in this country. This is a reminder that the town was an extremely important and prosperous centre during medieval times. In Roscommon Abbey A visitor’s Guide Kieran O’Conor and Brian Shanahan chart the history and architectural development of Roscommon Abbey from the mid-thirteenth century onwards. 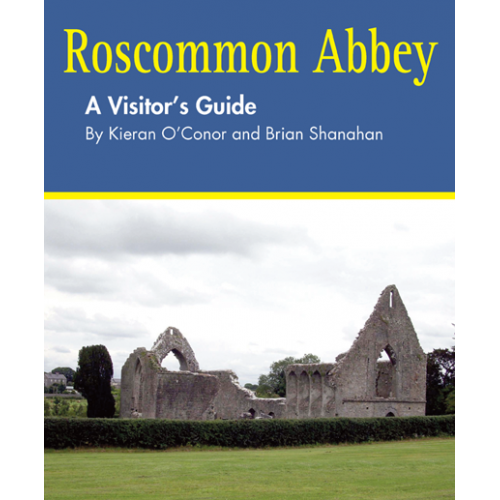 The full colour illustrated guidebook explores: Ecclesiastical activity at Roscommon before the Dominicans; Who were the Dominicans? The foundation of the priory in 1253; The subsequent history of the priory; The siting of the priory; The physical remains at Roscommon priory today; A tour of the thirteenth-century priory and a tour of the fifteenth-century priory. The guidebook also includes two detailed historical reconstruction drawings by Daniel Tietzsch Tyler and a box text by Colmán O Clabaigh OSB outlining a typical day in the life of a Dominican Friar in medieval Ireland.